The Mormon handcart pioneers were participants in the westward migration of members of The Church of Jesus Christ of Latter-day Saints who used handcarts to transport their supplies and belongings while walking from Iowa or Nebraska to Utah. The Mormon handcart movement began in 1856 and lasted until 1860. Motivated to join their fellow Church members in avoiding persecution but lacking funds for full ox or horse teams, nearly 3,000 Mormon pioneers from England, Wales, and Scandinavia made the journey to Utah in 10 handcart companies. For two of them, the Willie and Martin handcart companies, the trek led to disaster after they started their journey dangerously late and were caught by heavy snow and bitterly cold temperatures in the Rocky Mountains of central Wyoming. Despite a dramatic rescue effort, more than 210 of the 980 pioneers in the two companies died along the way. Although fewer than ten percent of the 1847–68 Latter-day Saint emigrants made the journey west using handcarts, the handcart pioneers have become an important symbol in LDS culture, representing the faithfulness, courage, determination, and sacrifice of the pioneer generation. The handcart treks were a familiar theme in 19th century Mormon folk music and handcart pioneers continue to be recognized and honored in events such as Pioneer Day, Church pageants, and similar commemorations. Suleiman I (/ˈsuːlimɑːn/; Ottoman Turkish: سلطان سليمان اول‎, Sultān Suleimān-i evvel or قانونى سلطان سليمان‎, Kānūnī Sultān Suleimān, Modern Turkish: I. Süleyman (Turkish pronunciation: [sylejman]) or Kanuni Sultan Süleyman; 6 November 1494 – 5/6/7 September 1566) was the tenth and longest-reigning Sultan of the Ottoman Empire, from 1520 to his death in 1566. 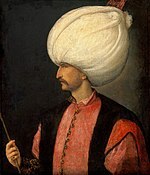 He is known in the West as Suleiman the Magnificent and in the East, as "The Lawgiver" (Turkish: Kanuni; Arabic: القانونى‎, al‐Qānūnī), for his complete reconstruction of the Ottoman legal system. Suleiman became a prominent monarch of 16th-century Europe, presiding over the apex of the Ottoman Empire's military, political and economic power. Suleiman personally led Ottoman armies to conquer the Christian strongholds of Belgrade, Rhodes, and most of Hungary before his conquests were checked at the Siege of Vienna in 1529. He annexed most of the Middle East in his conflict with the Safavids and large swathes of North Africa as far west as Algeria. Under his rule, the Ottoman fleet dominated the seas from the Mediterranean to the Red Sea and the Persian Gulf. At the helm of an expanding empire, Suleiman personally instituted legislative changes relating to society, education, taxation, and criminal law. His canonical law (or the Kanuns) fixed the form of the empire for centuries after his death. Not only was Suleiman a distinguished poet and goldsmith in his own right; he also became a great patron of culture, overseeing the golden age of the Ottoman Empire's artistic, literary and architectural development. He spoke four languages: Ottoman Turkish, Arabic, Chagatai (a dialect of Turkic languages and related to Uyghur), and Persian. ... that, when Ghenadie Petrescu (pictured) was ousted from his post of Metropolitan-Primate, Romania experienced protests and riots? ... that the British destroyer HMS Highlander escorted Convoy SC 122 through the largest convoy battle of World War II in March 1943 and was unsuccessfully attacked by U-441 and U-608? ... that in 1911, John Gaunt's second biplane nearly crashed because a bystander bent the aircraft's elevator before a flight? ... that Themistokli Gërmenji, an Albanian nationalist, received the French Croix de Guerre in November 1917, but was executed shortly thereafter by a French military court? ... that fish-knives inscribed with Elokeshi's name were sold after her husband decapitated her with a fish-knife following her adulterous affair with a Hindu head-priest? ... that the ancient Roman dancer Galeria Copiola reached the age of 104? ... that to escape burning at the 1393 Bal des Ardents Charles VI of France huddled under the gown of the Duchesse de Berry, while a lord leaped into a wine vat? ... that a junior officer on the USS Ancon refused King George VI entry to the ship's intelligence centre because no one told him the King "was a Bigot"? The San Francisco Mission District burning in the aftermath of the San Francisco earthquake of 1906, April 18, 1906. The majority of the city's buildings were wood; taken on a rooftop near the fire by H. D. Chadwick, this image shows them burning heavily following the 7.9 MW earthquake.